That's what I did, camera added but it refuses to connect and showed as offline. Connect via Lan cable next ? I was looking for wide-angle lens IP Camera and I came across this forum.. Saw lots of people talking about this person called Dean. So I tried to enquire. He was swift and provided very good support. Gave me and family the feeling as if we are some VIP customers. I thot we should try Sineoji cameras then since support is impt to us. Anyways, this is my review. I have not tried other brands. So can't compare, but so far my experience with Sineoji has been superb! Well Done! Just call their Cso, go your house fix. Since is part of the package. If not come back here and shout. 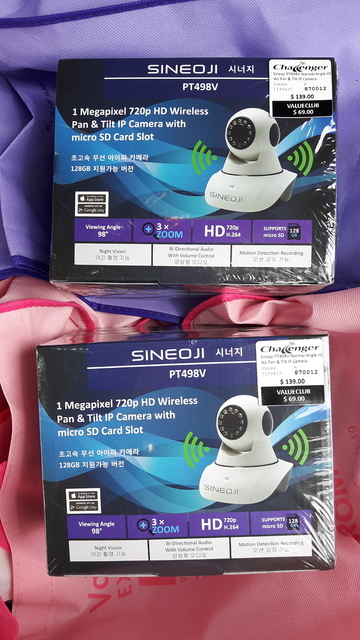 Someone will auto pm you..
which challenger outlet carry the new sineoji PT528V IP camera ? $99 for value club member, before I head down. Preferably in Parkway Parade. 120° viewing angle is ideal . anyone got experience with windows hp 950 xl using windows 10, and dlink has no app to view dlink dc5222L ip camera on their hp via remote ? Their site says win 10 not supported for these ip cams. Anyone got any idea how or which app in windows store to get to view remote using microsoft window hp 950 xl ? I'm looking for VSTARCAM representation here. Anyone? CEF Ideas? Actually SG now has around 20 agents or so. Strange. Thought can call Dean and deliver direct plus install? How come still need to go challenger when you can go direct to source? Just use the search la. Why diy when u can call CSO n they come install for U? They have very good customer service one. Anyone care to comments on this? The 180° model? Thks. just call the sineoji main line and you can reach him. I just renewed my challenger membership and bought 2 sineoji 498 cameras. Hi guys, im having an old vstarcam T38x series. Recently i change my wifi router. May i know how to reconnect the cam to wifi again? Thx..
can I ask which Challenger did you get this from? It was not available online ..only this week can see is available online. But already got it from Challenger. If I were you, get the 528 model. I paid only $99 from.Challenger..